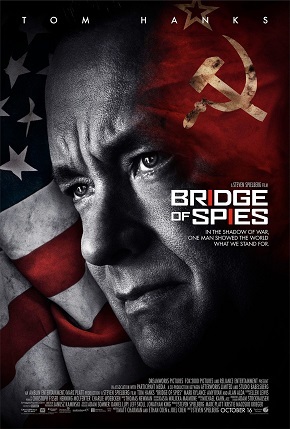 Bridge of Spies, directed by Steven Spielberg, is a loosely fictionalized account of an actual incident that took place during the Cold War. In 1957, the FBI arrests Rudolf Abel (Mark Rylance), a Soviet spy living in the United States. James B. Donovan (Tom Hanks) is the lawyer who takes his case. While Abel’s case is wending its way through the courts, Francis Gary Powers (Austin Stowell), a U-2 pilot, is shot down over the Soviet Union. The government asks Donovan to negotiate a prisoner exchange of Abel for Powers. I found this film entertaining, even though there were some things in it that I found hard to believe. Spielberg shows his characteristic tendency towards hamminess. For example, when the FBI agents show up to arrest Abel, they arrive in several cars that all come to a screeching halt in the middle of the street. The agents then burst through Abel’s hotel room door. Does anyone really believe that this is how the FBI arrests a suspected spy? (According to Wikipedia, two FBI agents knocked on Abel’s door.) In another scene, someone fires gunshots through the window of Donovan’s house. This never happened. Is it really too much to ask that I be allowed to sit through a film without having my intelligence insulted? Spielberg seems to have no compunction about doing this, which is why I have never been one of his great admirers. 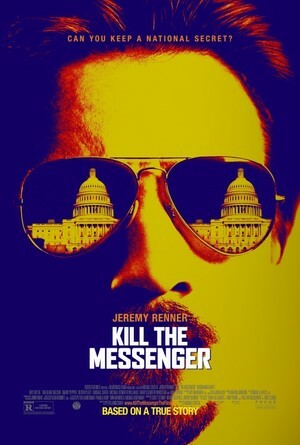 Kill the Messenger, directed by Michael Cuesta from a screenplay by Peter Landesman, tells the story of Gary Webb, the journalist who reported on contra drug-dealing in the US, and who was blacklisted by the news media for his efforts. The film follows Webb (Jeremy Renner) as he gradually uncovers the story and then writes about it for the San Jose Mercury News. The article causes a sensation, but then it immediately comes under attack from major news outlets, such as The New York Times, The Washington Post, and The Los Angeles Times. Webb then struggles to defend the article, as well as his reputation. An interesting question here is: why was Webb’s article so controversial? I remember during the 1980’s hearing rumors that the contras were running drugs. A Senate committee eventually confirmed this as true. So why did Webb’s revelations upset so many people? I can only guess it was because Webb drew an explicit connection between the contras and the crack cocaine epidemic that swept South-Central Los Angeles in the 1980’s. I remember at the time, some journalists expressed fear of “black anger” as a result of Webb’s article. This film suggests another possible motive: reporters at major newspapers were incensed that they had been scooped by a mid-size paper. Webb was, in that respect, a victim of the news media pecking order. What this movie also makes clear is the extraordinary vindictiveness of these people: even after the CIA admitted that Webb’s story was basically true, he was unable to get work at any newspaper. Kill the Messenger is a tribute to a courageous reporter. Lately, I have been reading David McCullough’s biography of Harry Truman. I’m interested in the Truman administration, because it was a pivotal period in our nation’s history. One thing I like about McCullough’s book is that it does a lot to dispel the myth of “Give ‘Em Hell Harry”. McCullough shows that Truman was often indecisive, and that he was reluctant to make decisions that he knew would be unpopular. Among other things, McCullough makes it clear that Truman should have fired MacArthur months before he did. (Truman did have a temper though. He once threatened to throw Joseph Kennedy out of a hotel window. You can’t really blame him for wanting to do that.) 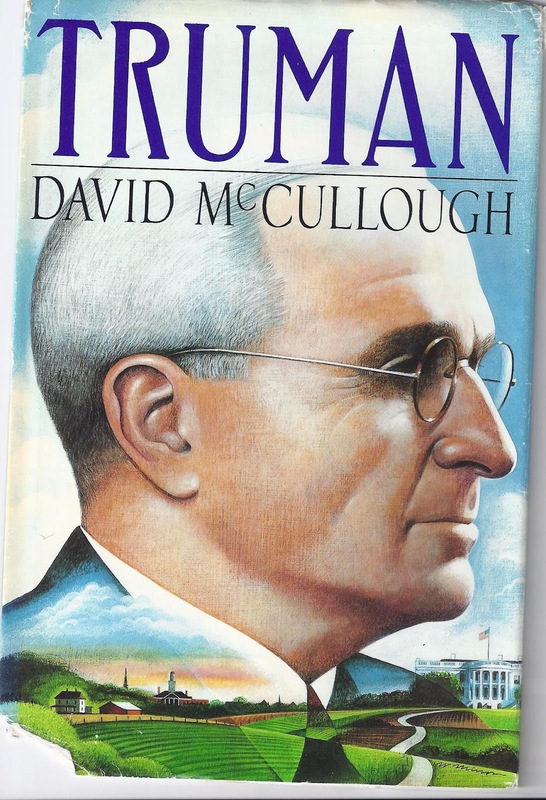 Although McCullough is highly sympathetic to Truman, he is nevertheless critical of him at times. He argues, for example, that Truman’s Loyalty Program helped set the stage for McCarthyism. McCullough is a skillful writer who is good at historical narrative, but his amassing of details began to annoy me after a while. He writes about such things as what clothes Truman wore and what he had for lunch on certain days. This is more than I really wanted to know about Truman. What makes this baffling is that he devotes one paragraph to the creation of NATO. And he says hardly anything about Truman’s policies towards post-war Germany. (Which was one of the issues I was interested in when I picked up this book.) Call me a philistine, but I think these topics would have been more interesting than Truman’s shirts. The 1965 Indonesian military coup was one of the most horrific events of the second half of the twentieth century. It killed over a million Indonesians, and it ushered in the Suharto dictatorship that ruled Indonesia for 31 years. It was an event that has not gotten as much attention in the West as it should. Peter Weir’s 1982 film, The Year of Living Dangerously is set in Indonesia in the months before the coup. Guy Hamilton (Mel Gibson) is an ambitious young journalist from Australia, who has just been given his first foreign correspondent assignment in Indonesia. He meets a mysterious photographer named Billy Kwan (Helen Hunt). Billy arranges for Guy to interview the head of the PKI, the Indonesian communists, a major scoop that helps Guy’s career. Billy introduces Guy to Jill (Sigourney Weaver), who is an assistant to the military attaché at the British embassy. Guy and Jill have an affair, much to the disapproval of Jill’s boss. One day, Guy learns from that there is a shipment of arms coming from China for the PKI. Over Billy’s objections, Guy decides to write a story about this, even though everyone will know that he learned about this from Jill, which will hurt her standing at the embassy. 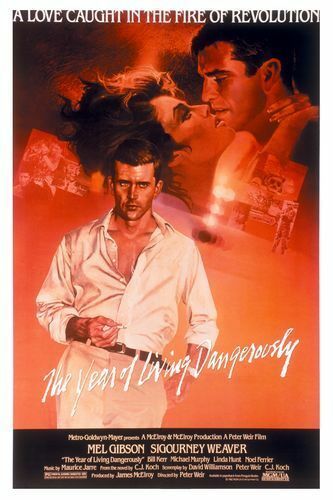 The Year of Living Dangerously is an oddly disappointing film, one that seems to promise far more than it actually delivers. There is a sense of foreboding during much of the film, because we know about the disaster that the characters can’t see coming. And some of the scenes seem to hint that more is going on than meets the eye. Yet the Indonesian coup ends up merely serving as the backdrop to a romance between Mel Gibson and Sigourney Weaver. There are depictions of poverty in Jakarta, and there is a scene of communists being executed by the military, but the the film is mainly about a group of wealthy Westerners. It would be interesting to see a film about the coup told from an Indonesian point-of-view. Hangmen Also Die is an entirely fictionalized account of the assassination of Reinhard Heydrich, one of the leaders of Nazi Germany. This 1943 film was directed by Fritz Lang, from a screenplay by John Wexley, based on a story by Bertolt Brecht and Lang. 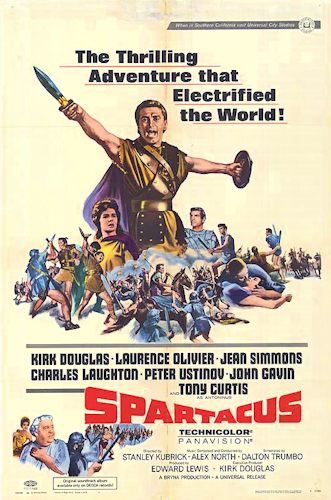 This was the only Hollywood film that Brecht worked on for which he received an on-screen credit. Lang had originally intended to have Brecht write the screenplay, but he apparently changed his mind due to aesthetic, political, and personal differences between himself and Brecht that made it increasingly difficult for them to work together. 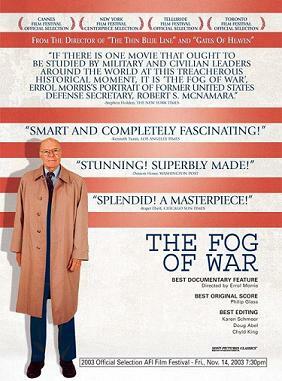 The film is set in German-occupied Czechoslovakia during World War II. Svoboda (Brian Donlevy) has just assassinated Heydrich, and he is fleeing down a street. Mascha (Anna Lee) sees him. When the Gestapo ask her where he went, she points them in the opposite direction. 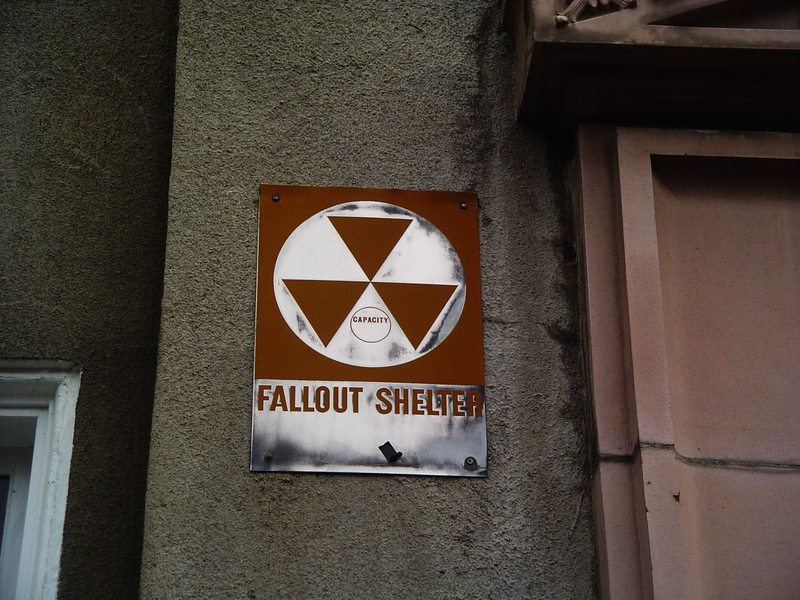 Svoboda, who is hiding nearby, observes this. Desperate for a place to hide, he follows her to her home, where he manages to persuade her to take him in, even though he knows that by doing so, he is placing her and her family in danger of retaliation by the Gestapo. John Wexley and Hanns Eisler (who composed the music) were both later blacklisted. Eisler was eventually deported because of his left-wing political views. Brecht left the country after being questioned by the HUAC. Despite its contrived and melodramatic moments, Hangmen Also Die does touch upon some complex moral and political questions, such as whether terror tactics, like assassinations, are ever a good idea. In the film, the Gestapo begin carrying out random executions in retaliation for the assassination. What happened in real life was even worse. The Nazis destroyed the Czech city of Lidice, killing most of its inhabitants or sending them to concentration camps. 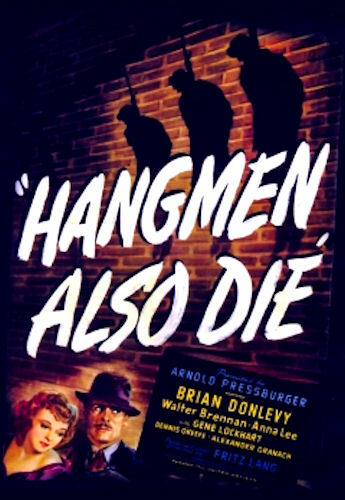 Although it is not one of Lang’s best films, Hangmen Also Die is nonetheless one of the more interesting films to come out of World War II. Fritz Lang made three films about the super villain, Dr. Mabuse. This character was clearly inspired by Conan Doyle’s Dr. Moriarty, as well as by Allain and Souvestre’s Fantômas. Like these two, Mabuse heads a criminal gang that carries out daring and elaborately planned crimes. (And, like Moriarty, Mabuse is a scientist.) Like Dr. Caligari, he is an expert hypnotist. Mabuse, however, has the added twist that he has the ability to perform telepathic hypnosis, making people do things against their will, sometimes simply by looking at them, even when they have their back turned on him. The character of Mabuse was created by the novelist, Nobert Jaques, but he is best remembered for the Fritz Lang films in which he appears. 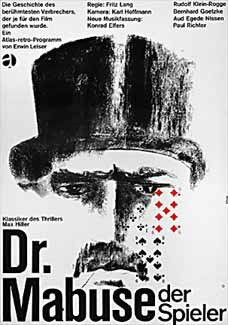 The four-hour Dr. Mabuse the Gambler was released in 1922 in two parts. Mabuse (Rudolf Klein-Rogge) uses his hypnotic abilities to swindle wealthy men at card games. With the riches he makes, Mabuse plans to make himself the most powerful man in the world. His activities arouse the suspicions of the courageous, but not overly bright, State Prosecutor Wenk (Bernhard Goetzke). The wheels of justice grind slowly, but they eventually catch up with Mabuse. At the end of the film he goes mad, and the police take him away to an asylum. 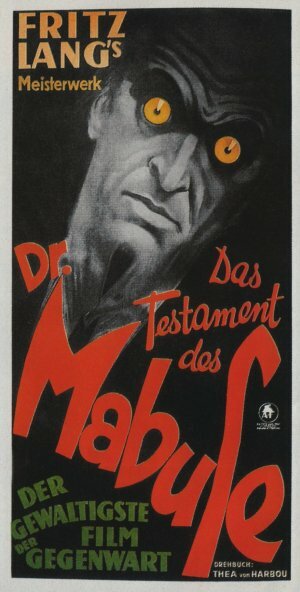 In The Testament of Dr. Mabuse (1933), the good doctor has been treated at the asylum by Prof. Baum (Oscar Beregi, Sr.). Through a special form of hypnosis, Mabuse begins to control Baum’s mind. Baum then forms his own criminal gang. He identifies himself to his henchmen, who are not allowed to see him, as “Dr. Mabuse”. After Mabuse dies, he seems to completely takeover Baum. Whereas, in the first film, Mabuse’s aims were pecuniary, Baum/Mabuse shows no interest in making money. His crimes are committed merely for their own sake. This time he is opposed by Inspector Lohmann (Otto Wernicke), who is a little sharper than State Prosecutor Wenk. Lohmann foils Baum/Mabuse’s plan to release a cloud of poison gas over Berlin. At the end of the film, Baum/Mabuse voluntarily commits himself to his own asylum. It has often been argued that Dr.Mabuse the Gambler anticipates Hitler. At times, Mabuse does express a megalomania that is strikingly similar to Hitler’s. It seems to me that a more plausible explanation is that Mabuse represents a type of cynicism that was common in Europe (and particularly in Germany) following the horrors of the First World War. Hitler’s Weltanschauung happened to be an extreme form of this cynicism. Mabuse can also be viewed as a Nietzschean, particularly in his attitude towards women. At one point he cruelly tells his lover that there is no such thing as love, only desire. Lang’s biographer, Patrick McGilligan, claims that this was Lang’s own view, even though the screenplay was actually written by Lang’s wife, Thea von Harbou. This raises serious questions in my mind about the reliability of McGilligan’s biography. In The Testament of Dr. Mabuse, Baum/Mabuse speaks of creating an “empire of crime”. This reportedly prompted Goebbels to ban the film, because he feared that people would see it as a criticism of the Nazis. (It didn’t have its German premiere until 1961.) This makes me wonder: did Hitler, Goebbels, and other Nazis see themselves as creating an “empire of crime”? If so, what does this tell us about the historical conditions that created the Nazis? In hindsight, there is something eerie about the fact that Mabuse tries to use poison gas as a weapon of mass murder. This is no doubt a coincidence, but one can’t help noting it. 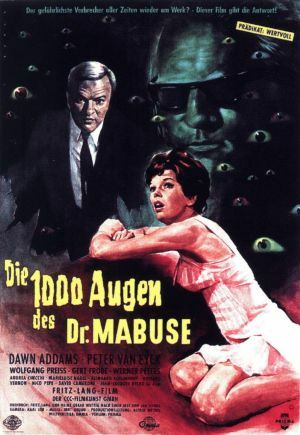 In The 1000 Eyes of Mabuse, made after the Second World War, Lang makes an explicit connection between Mabuse and the Nazis. We are told that the Luxor Hotel was used by the Gestapo, and Mabuse employs secret rooms and cameras that they used. No doubt this idea came to Lang in response to the enormity of what had happened. It makes this film an unsettling diminuendo to what is perhaps the greatest film trilogy ever made. During the six and a half years that I lived in Oregon, I always saw this sign along the I-5 whenever I was driving from Eugene to Cottage Grove. I’ve wondered if anyone ever satisfied this man’s tremendous need for fill dirt. 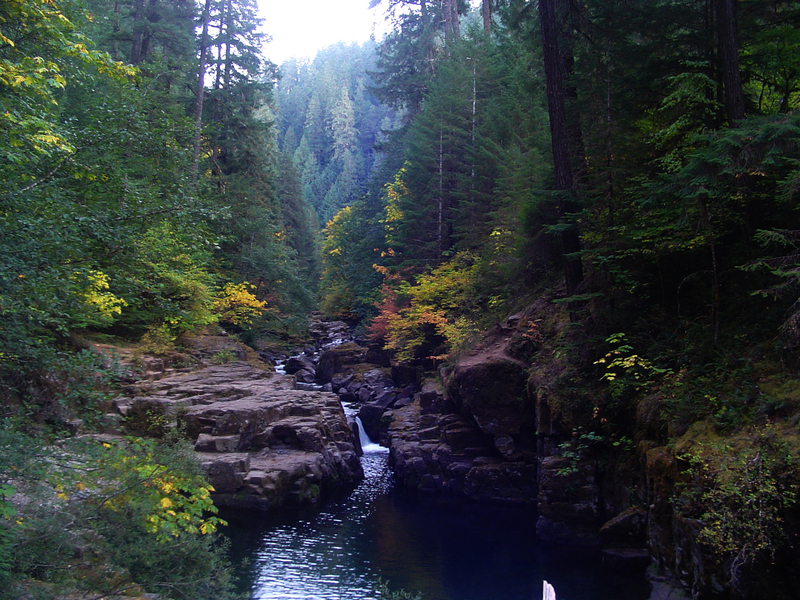 Due to some unforeseen circumstances, I had to delay my move to Los Angeles for a few days, so I decided to drive to Umpqua National Forest, which I had never been to before. 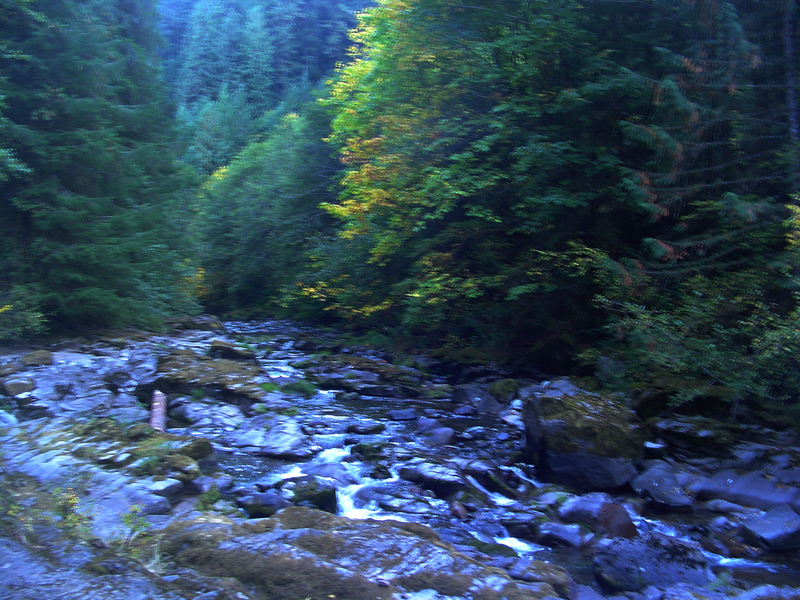 It is a gorgeous wilderness that extends from the Willamette Valley up into the Cascade Mountains. 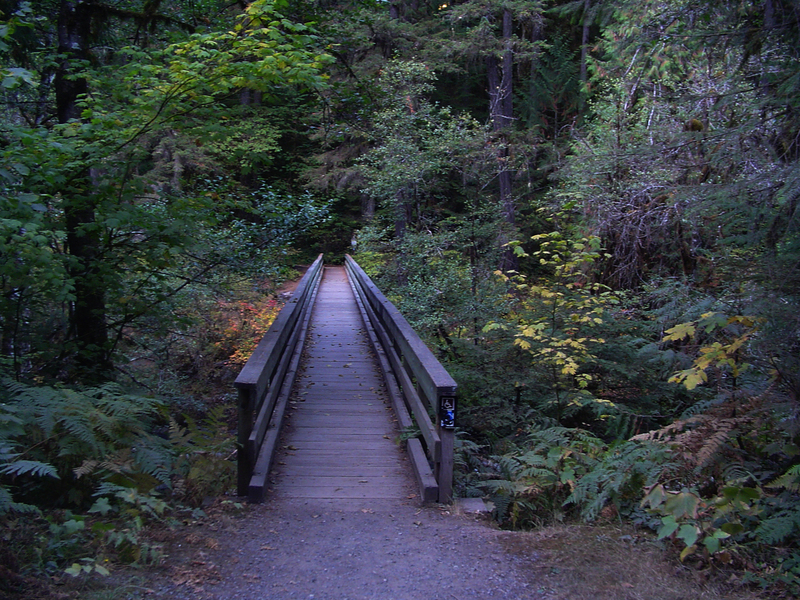 I walked along a hiking trail that went alongside a creek. 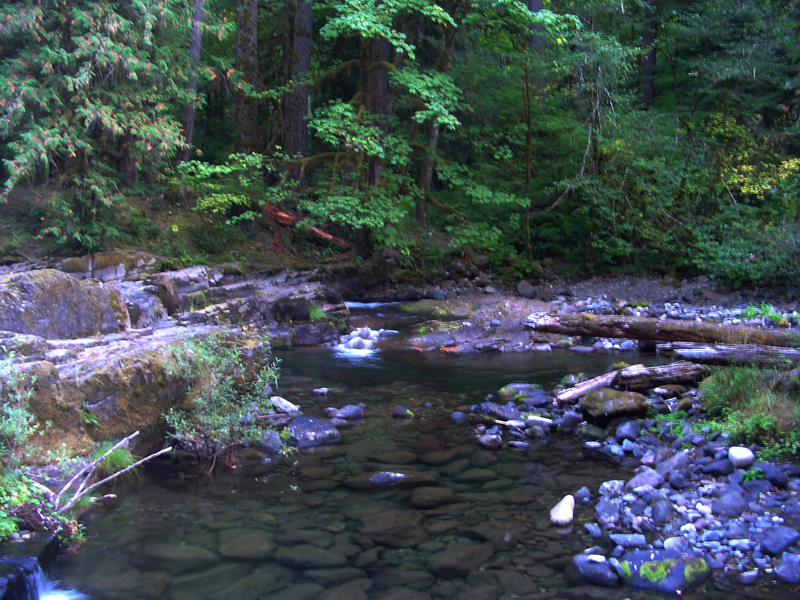 The forest was extremely dense. 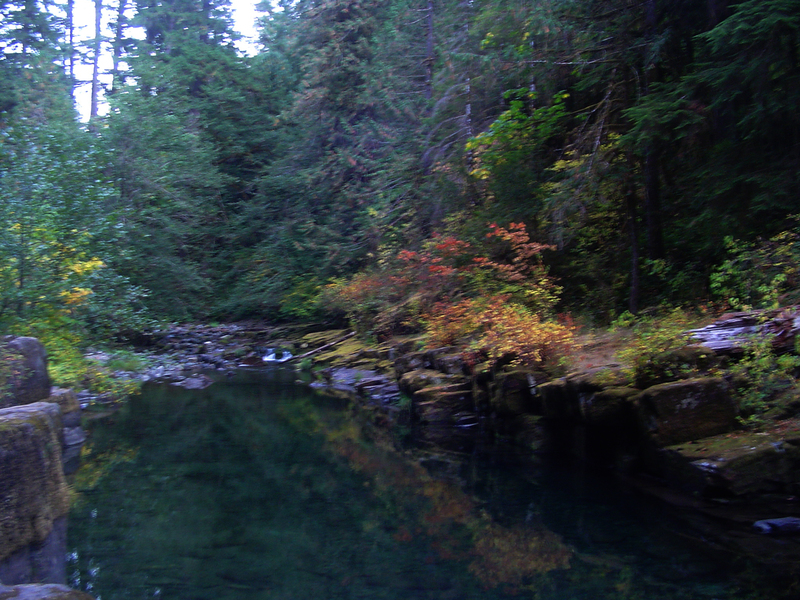 There were thick clumps of moss growing all over the tree branches. It was all a bit gloomy, albeit in a beautiful way. I kept thinking this place would make a good setting for an H.P. Lovecraft story. 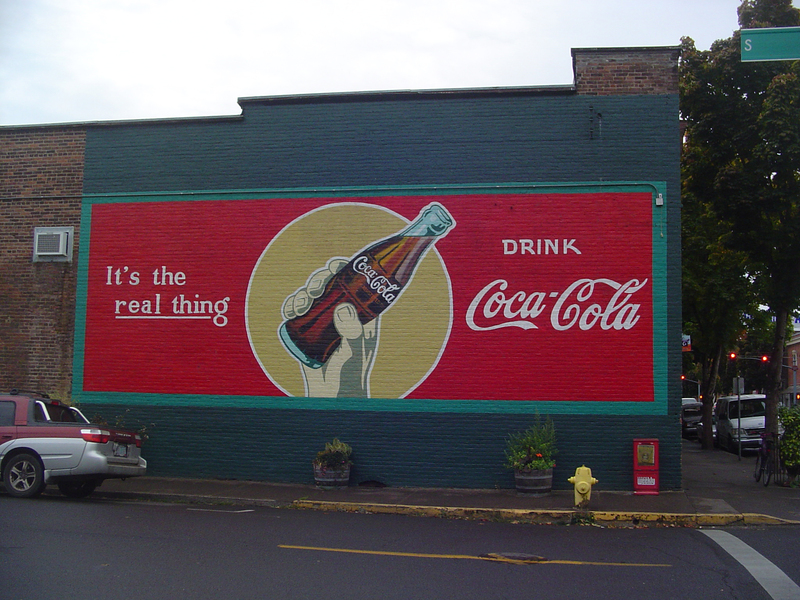 On my way back home, I decided to swing by the funky little town of Cottage Grove. 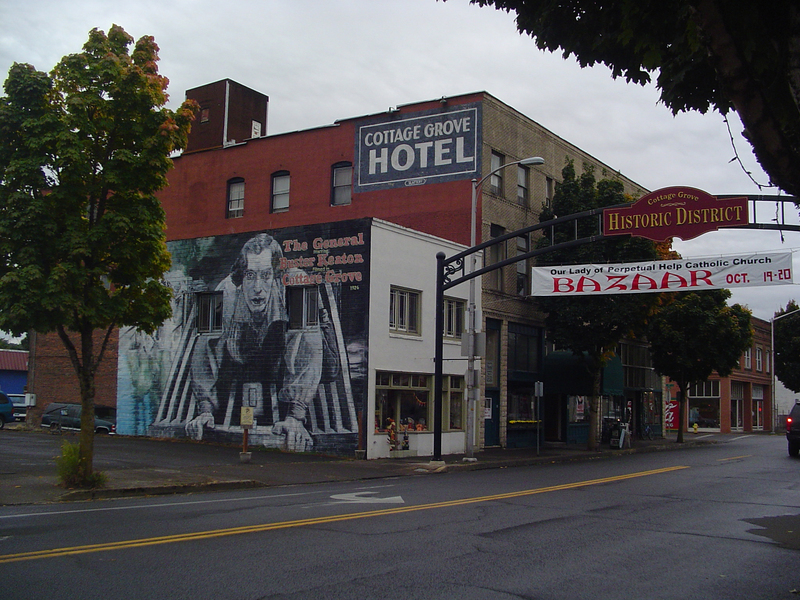 This place is most famous for the fact that Buster Keaton’s The General was filmed here. (Animal House was also filmed here, although, not surprisingly, nobody feels proud about that.) The town has an annual Buster Keaton Day. 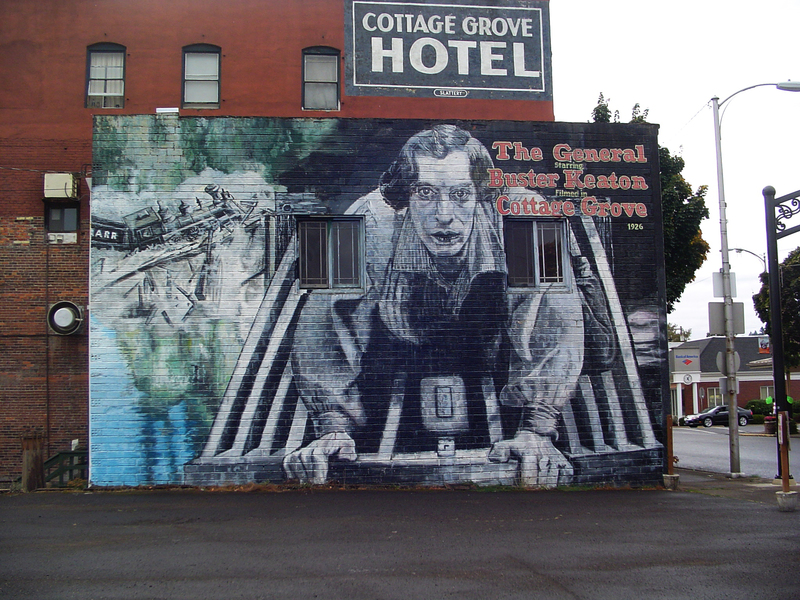 It also has a mural of Keaton located on its Main Street. 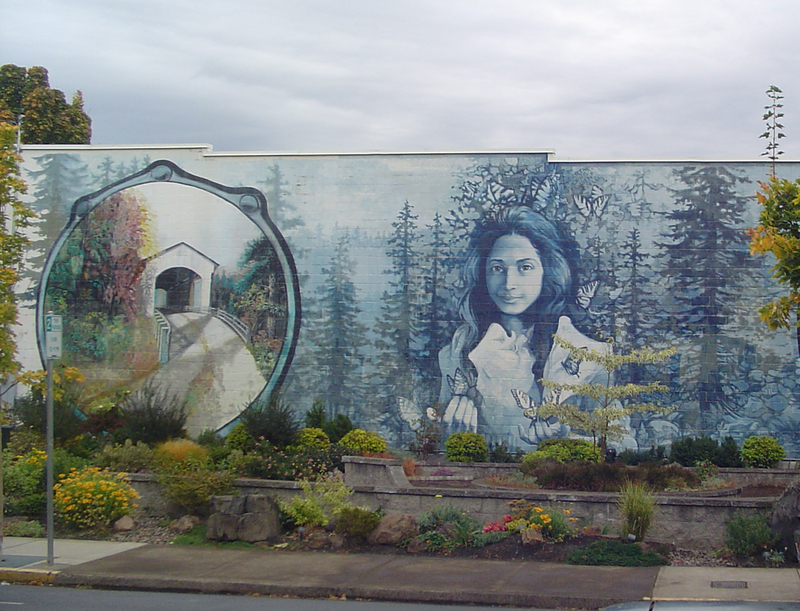 Opal Whiteley prominently featured in a mural honoring Cottage Grove. I find it a bit ironic that Cottage Grove has chosen to honor Whiteley in this way, considering that Whiteley disdained her Oregon background and upbringing. She devoted a large amount of time and energy to claiming that she was the daughter of a French aristocrat, Henri, Prince of Orléans, and that she had been sent away to be raised in a lumber camp in Oregon. (I guess that this sort of thing happens all the time to the daughters of the French aristocracy.) She spent the last fifty years of her life in a nursing home in London, where the staff referred to her as “the Princess”. She was buried under the name, Françoise Marie de Bourbon-Orléans. One of the reasons for the ongoing fascination with Opal’s life is that it is not clear whether or not she was a fraud. My guess is that she was probably suffering from a mild form of schizophrenia. Said to be a some kind [sic] of spirit that will chase you off of the hill at night time. Around the graveyards there are said to be many apperinces [sic] of the ghostly kind. Beware of the thing that will chase you off the mountain at night time. When I climbed the hill, I did go back down at sunset, although I am not aware that I was being chased by anyone or anything. 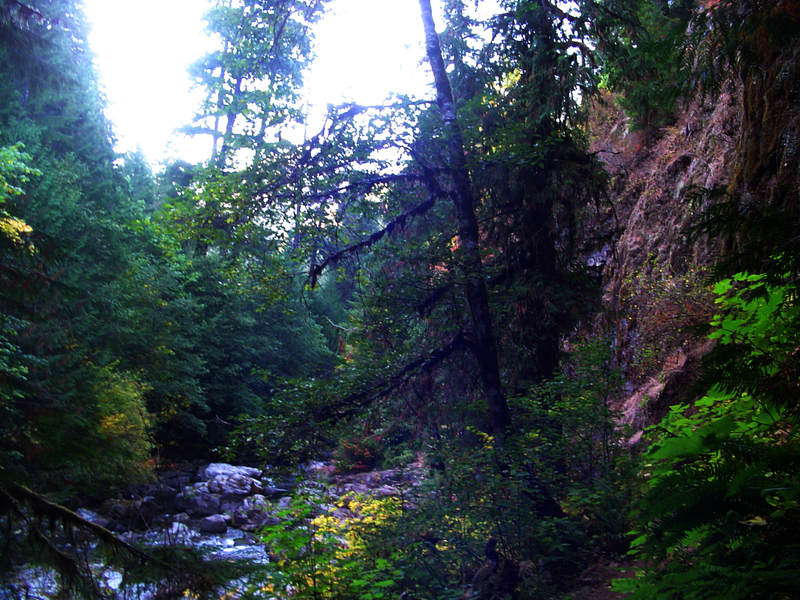 Besides, I think I would be more frightened to run into a mountain lion than into a ghost. One thing I did notice as I was walking along the ridge was an almost perfectly circular impression in the ground, about twenty feet across. 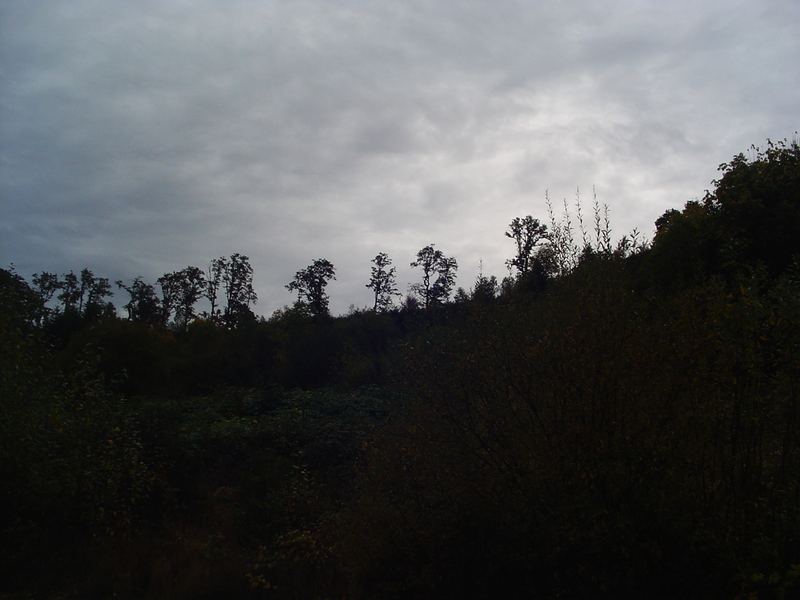 I have since learned that there used to be an oil well on top of the hill, which perhaps explains that odd formation. 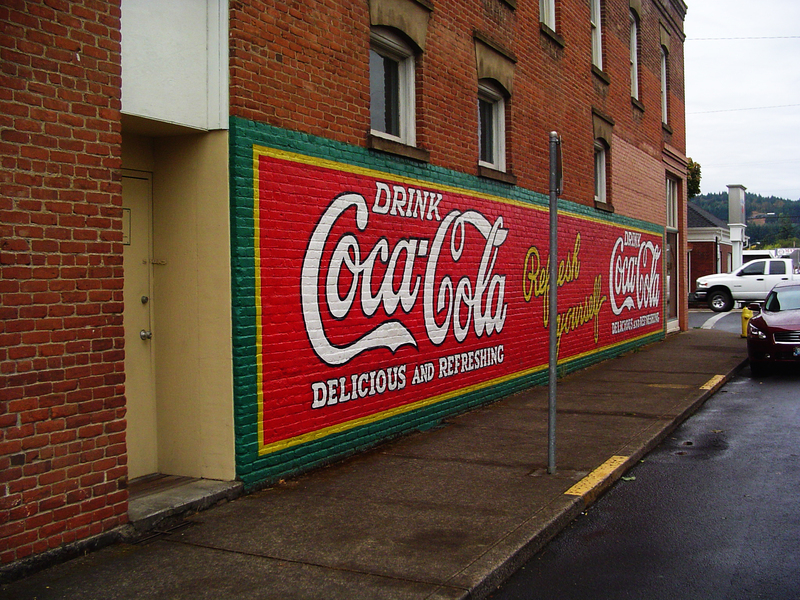 Another mural on a similar theme. There used to be a gun store at this location. This is progress. 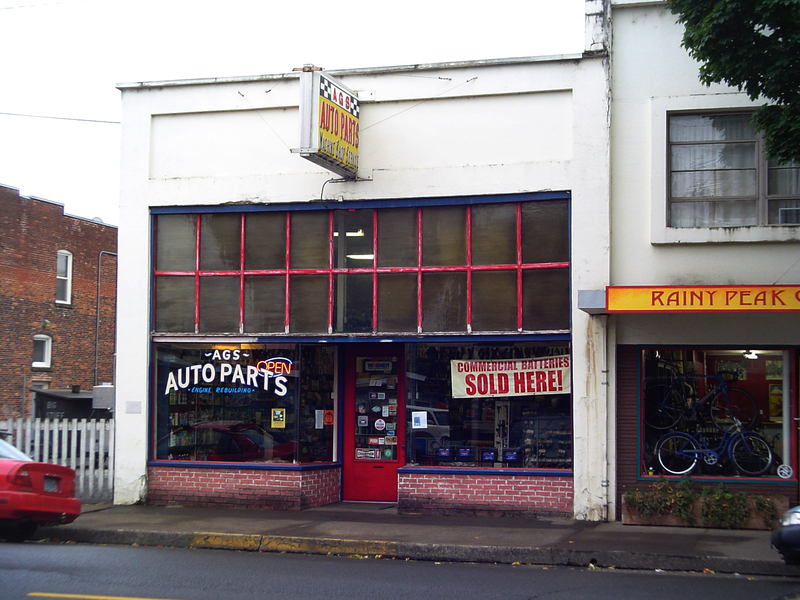 If I lived in Cottage Grove, I would definitely go to this place for all my automotive needs. 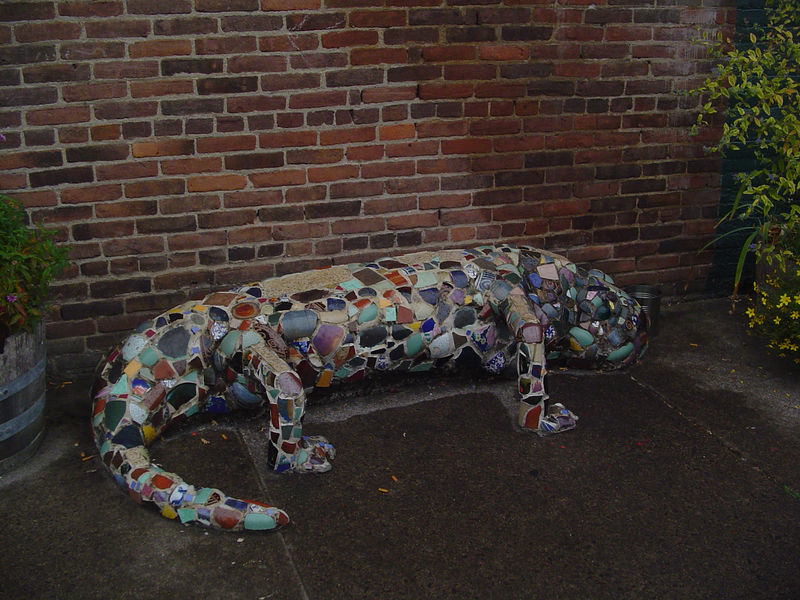 Public art, or a bench? You decide. 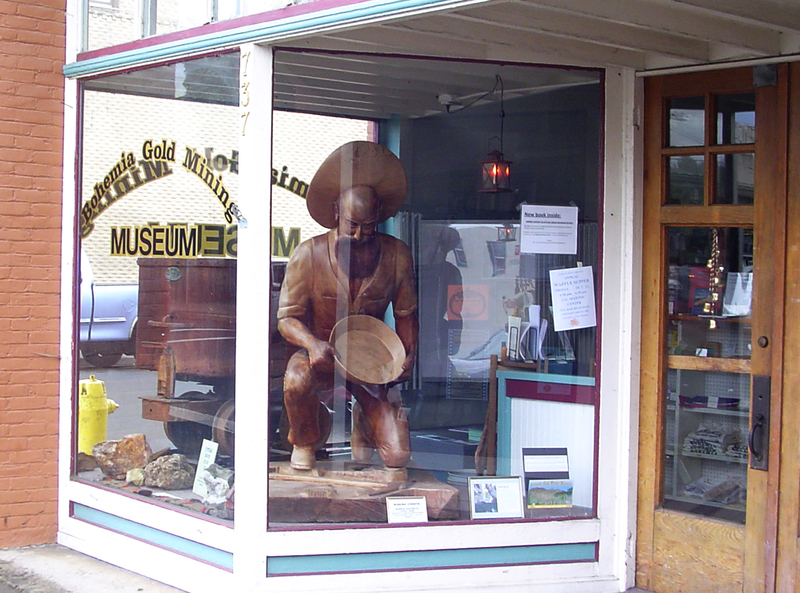 The Bohemia Mining Museum may be closed, but this would-be capitalist is determined to follow that fine old American tradition of trying to get rich quick and failing at it. 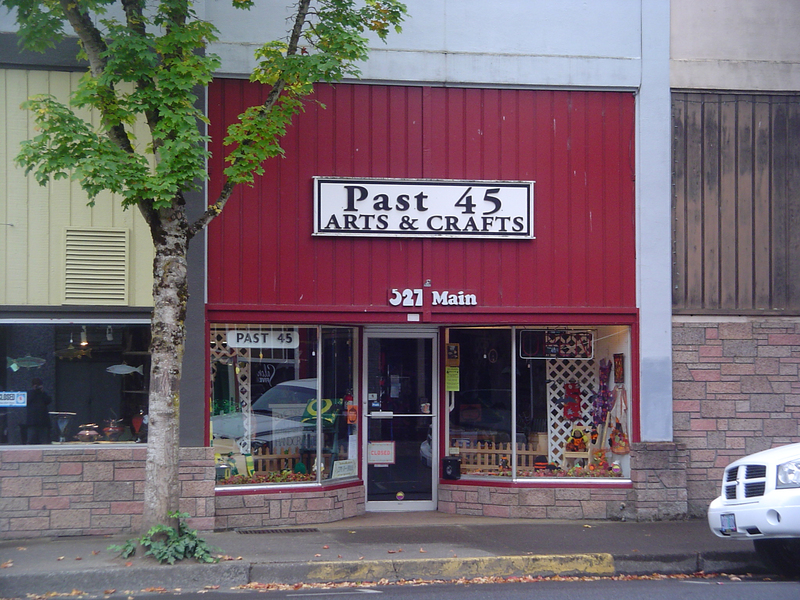 This sign is on a building which used to be Cottage Grove’s City Hall, but which now houses a ballet school and some small businesses. I used to see signs like this all over the place when I was growing up. Yes, this actually gave me a twinge of nostalgia for the Cold War. Does that make me a bad person? My conclusion: for America to survive economically in the coming Sino-Japanese world, an alliance with the Soviet Union is a necessity. After all, the white race is the minority race with many well-deserved enemies, and if the two great powers of the Northern Hemisphere don’t band together, we are going to end up as farmers—or, worse, mere entertainment—for more than one billion grimly efficient Asiatics. The kindest thing one can say about this is that it shows that Vidal was completely ignorant about Asia. Vidal surely must have been aware of the “Yellow Peril” rhetoric that was common in the early twentieth century. And bear in mind that he was making this argument in a country with a history of discrimination against Asians, including the internment of 110,000 Japanese-Americans during World War II. In the same article, Vidal says that Norman Podhoretz is not an “assimilated American”. This comment provoked accusations of anti-Semitism. 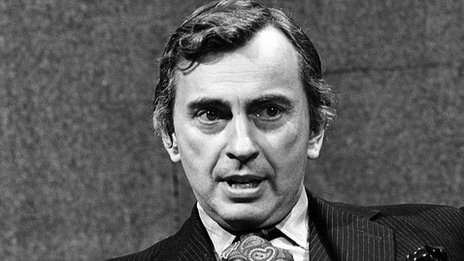 Vidal once said of Hilton Kramer that his name “sounds like a hotel in Tel-Aviv”. If the human race is to survive, population will have to be reduced drastically, if not by atomic war then by law, an unhappy prospect for civil liberties but better than starving… it may already be too late to save this ark of fools. Vidal would perhaps have been pleased to know that the birth-rate in Japan has been falling. Despite all his faults, I am saddened by Vidal’s passing. He was a public intellectual, a type of person that is becoming increasingly rare in the United States. Unfortunately, the media often saw him as a figure of entertainment rather than enlightenment. They could never get enough of his silly fight with Norman Mailer or his tiresome feud with Truman Capote. It seems the media must trivialize everything, including writers.